Overlooking the glorious sandy beach, this stylish, modern hotel offers friendly and attentive service. The attractive pool area and conveniently location make it perfect for adults and families alike. This is hotel was set in a beautiful location. The main parts of the hotel were nice and clean, but we were on the ground floor. Our room was crowded as it had three beds in it. We were reluctant to open our curtains on to our patio as every man and his dog walked past. The decore left a lot to be desired and it could use a face lift. The breakfast were good and you could have a picnic lunch which wasn't so bad but the meals at night were all catered towards the Spanish people staying. We were told before we went that some Spanish would be staying, but we ended up in a minority. All entertainment was in Spanish so you could not join in, the staff struggled to understand us and sometimes it felt they ingnored us. The area itself is stunning if not very hot (43 one day)there is not a lot to do but if you want to laze by the pool or beach it was great. asked for extra pillows from our rep and reception, finally got them from Myrfim the First Choice rep who was brill. Would maybe go again but to a diffrent hotel, The Old Tavern is a must for Sunday Carvery!!!! My wife and I went on a specialist dancing holiday with ballroom and latin dancing every night and with four daytime lessons. The dancing provided by Holiday and Dance was wonderful. We saw very little of the hotel entertainment which seemed to be provided for the Spanish Geusts. The food was exceptionally good with a very good selection both at breakfast and Dinner. The only problem we has with the hotel was regarding the bar. There was never eneogh staff and it took ages to be served. Also the bar closed very early. Our evening dances finished at 11.30 and most evenings we could not get any hot drinks at the bar as they were already closing down. The pool was well maintained and in all the hotel was extremely clean. We would consider returning to the hotel. Had a lovely family holiday for one week in August. We wanted a hotel right on the beach having 2 small children we didn't want far to walk. Hotel very clean, room cleaned daily and was a good size as well a balcony overlooking sea and Pueblo Mojacar on the hill. It was actually a refreshing change to be in a hotel with the majority of Spanish people. Enjoyed watching their culture. Food excellent and staff spoke enough English to understand. Dining room got noisy at times but we just ate early and avoided congestion, but enough food to feed an army. Entertainment fine and our two children enjoyed the mini disco etc. age 5 and 1. Hotel at the quieter end of the beach with a few beach bars at hand. We actually enjoyed the quietness and less hustle and bustle side to this area. With 2 small children we had enough entertainment ourselves. Beach clean and not packed, but a little rough at times but our two still had fun. If you want a quieter resort but with a large hotel feel mainly Spanish then this is for you. We had a lovely week and would come back! Hotel is very nice, overlooking the ocean. We were the only Irish in the Hotel, there were a few English, but I think the whole of Spain and their families happened to be staying while we were there. It was very loud, the pool area is very small and crowded with not half enough sun loungers, and what are there usually have towels on them from the night before, or from early morning. This could be a very nice Hotel, but when the Spanish are there everyone else takes a back seat as far as service is concerned. The staff dont speak very good English, with the exception of one very dark skinned waitress in the pool bar called Elizabeth who is an absolute gem, look after her she is one of a kind in this Hotel. Cross over to the beach, the water is so clear, but watch out for the current, look for a green flag before letting the kiddies in, and be warned the water gets very deep a few feet in. Hotel is ok, very nice if you are Spanish, they look after there own here. Swimming area is over crowded and noisy, not half enough beds. In House Animation team are very noisy, there is constant loud music blaring out from the speakers around the pool all day. Sorry I dont have any positive comments about this Hotel. Food was good, but the restaurant was so noisy, you could not enjoy your food. We took to the beach for the rest of the week. I would go back to Mojacer, but not to a hotel. 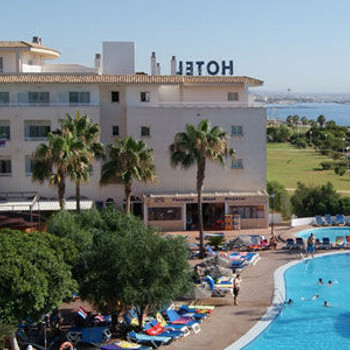 We stayed in the best mojcar hotel in August.It was our first famoly holiday with my 6 year old daughter The staff were so ignorant and only dealt with you if you were spanish the pool was always full with spanish music blaring from morning to night.The food room was full of flies only had one meal in it. The kids club that was in the hotel was a disaster if you speak English. Only caters for Spanish children activities. The hotel not near any faclities. Very hard to get a taxi. Please note that although this is a good 4**** hotel it is claimed to be on Mojacar Playa,it is, but the Playa is 7km long and this hotel with some others is at the far end much closer to Garrucha and nowhere near any shops,bars or restaurants. Bus rides which finish early evening and taxis which are near impossible to get or a hire car are the only answers other than a long walk.John. The hotel was as good as the 4 star rating, with the food coming at the top of the list. Entertainment may have been poor due to early season booking.